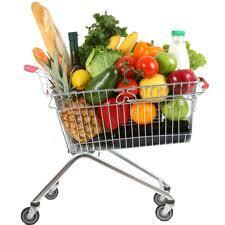 Plan what you are going to eat for the forthcoming week and write a shopping list. Stick to your shopping list when you are in the supermarket. Take a pen and tick off the items on the list as you go, so that you buy everything you needed and so that you don’t stray from the list. Don’t be swayed by special offers on unhealthy foods. Don’t go shopping when you are hungry. Don’t buy foods that you know you will not be able to resist such as biscuits and chocolate. Three ingredients, three steps to make these light pancakes within minutes! Beat eggs and milk together in large bowl, then beat in flour until batter is smooth. Lightly coat a 20cm frying pan on medium-high heat with cooking spray. Make one pancake at a time by dropping a large spoonful of batter onto pan and tilting to cover the whole surface of the pan evenly. Cook until golden, turning once, about 2 minutes per pancake. 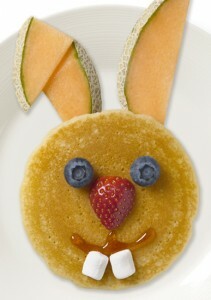 Have fun decorating your pancakes, for example Easter Bunny pancakes as shown here. The cold and flu season has begun. While there is no way to cure the common cold or the flu, healthy eating during cold and flu season can help prevent you getting sick. Researchers have found positive links between immune function and components in food. Garlic may boost your immune system, increasing resistance to infection and stress. Raw garlic is an expectorant – good for chest infections and coughs. Yoghurts and other dairy products contain probiotics, beneficial bacterial with immune boosting benefits. Also check dairy product labels for vitamin D. Early research suggests low levels of vitamin D may be linked to a seasonal increase in colds and flu and a higher incidence of respiratory infections. Get plenty of rest. Get at least seven to eight hours sleep a night. Eat a well-balanced diet. Healthy foods such as vegetables, fruit, grains, etc. are an important part of keeping your body nutrition at its best. Processed, fatty, and sugary foods don’t give the immune boosting protection that healthier food does. Keep well hydrated. 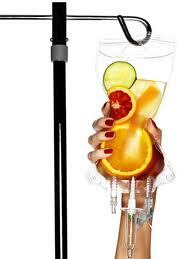 Dehydration inhibits the immune system’s functioning. 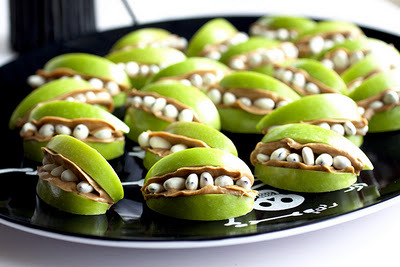 While researching for this Halloween blog I came across this recipe for Monster Mouths. They look really good and are also a healthy alternative to sweets and fizzy drinks. Glycaemic Index is a measure of how high your blood sugar gets after eating a food. It was originally designed to help people with diabetes to make better food choices but research has found that it might be useful in helping people to get to and stay at a healthy weight. How does GI help with weight? High blood sugar from high GI foods cause increases in the amount of insulin your body makes. Insulin helps to lower blood sugar levels after a meal but it also is important in helping your body to store other nutrients including fat. High levels of insulin encourage your body to store fat, rather than burn it. This means that when blood sugar increases it can encourage your body to store fat. When you eat low GI foods your blood sugar level stays lower (but not too low) and so insulin stays lower and this can encourage your body to burn fat. Low GI foods are also more satisfying and help keep your metabolism running faster. This is why they are important for helping anyone to lose weight or to keep off weight they have already lost. Which foods are low and which are high GI? Only foods with carbohydrate can raise blood sugar levels. 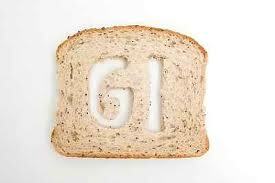 Any foods with no carbohydrate are low GI foods. Foods with no carbohydrate include meat, chicken, fish and eggs. 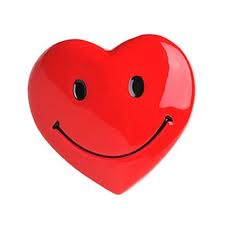 September is Happy Heart Month. Follow the link below to see the great work that is being done to promote your heart health by the fantastic organisation that is the Irish Heart Foundation. We all know how difficult it can be to come up with different, healthy and fun lunch box ideas – and that is why we end up packing up the same lunches over and over again! Packed lunches, just like any other meal, should have a balance of ingredients to fit in with healthy eating guidelines. Offer a variety of foods throughout the week. Just like adults, kids can get bored with having sandwiches everyday for lunch. Why not try using the same fillings, but add excitement by changing the bread e.g. pitta bread, bagels or tortilla wraps. Make sure food looks good as well as tasting good by adding different colours and textures. Forget about your typical lettuce and tomato salad. Instead try a pasta salad or potato salad. Cook and drain the pasta or potatoes and mix with a little mayonnaise or olive oil, then add some cut up vegetables such as tomatoes, cucumbers and carrots. If you like you can also include some sliced turkey, chicken or ham. If you decide to pack a traditional sandwich, try cutting the bread with fun shapes using a cookie cutter. Sometimes kids, especially younger ones, don’t like to eat a whole sandwich or bowl of food. Instead you can try preparing cut up cubes of cheese, grapes, baby tomatoes, carrot sticks and mini crackers. Finger foods are really very appealing for all ages! 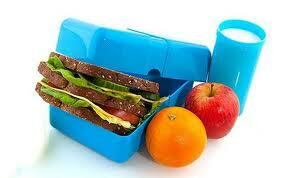 Always include a drink in the lunch box to make sure they don’t become dehydrated during the afternoon. Water, fruit juice and milk are all healthy choices. Make sweet stuff, such as chocolate, biscuits and cakes an occasional treat rather than everyday items. One portion of vegetables or salad and one portion of fruit (fresh, canned or dried can all count). One portion of a milk or dairy item such as milk, cheese, yoghurt or a yoghurt drink. One portion of meat, chicken, fish, eggs, peanut butter, beans or other protein source. 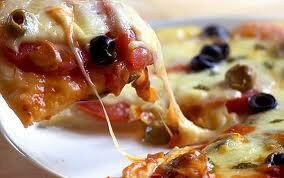 One portion of a starchy food, such as bread, pasta, rice, noodles or potatoes. Joint pain is not pleasant, and today, more and more people are beginning to suffer from joint pain at earlier ages than before. Active people, are complaining about sore, stiff and painful joints, and looking for a good natural relief from this discomfort. 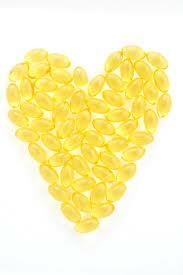 Fish oils are considered a dietary means of helping to deal with painful joint pain. Well, fish oil contains EPA and DHA, commonly referred to as omega-3 fatty acids. Omega 3 has a number of beneficial effects on the body, including the joints. Omega-3 fatty acids have been shown to reduce inflammation by interfering with the production of inflammation-producing chemicals which stimulate pain nerves in the tissues. When you add these benefits to the others known to be associated with fish oil like lowering triglycerides, reducing the risk of blood clots, and benefiting both the heart and brain, there is no doubt that it is a beneficial joint supplements. What foods contain omega 3? Oily fish is the richest source of Omega 3. This includes salmon, mackerel, rainbow trout, fresh tuna, herring, shrimp, crab, sardines and pilchards. Weaker sources include flaxseed or linseed oil, rapeseed or canola oil, walnuts, and dark green vegetables. 2 portions of fish per week, at least one of which must be oily is sufficient for general health. This is equivalent to 500mg of Omega 3. 3-4 portions of oily fish, or 1000mg, is strongly recommended if you have heart disease or are at risk of heart disease. You do not need a supplement if you are eating oily fish as recommended. If you dislike fish or have high requirements for omega 3, taking omega 3 in supplement form should be considered. There are many Omega 3 supplements on the market. Takeaways are often cheap, convenient and satisfying but, unfortunately, they are not always very healthy. Here are some tips on foods to avoid and healthier options when ordering your favourite takeaway. Try to avoid: thin-cut chips, pies such as cheese and onion pie or steak and kidney pie, jumbo sausage. Try to avoid: fried rice, fish cakes, spring rolls, prawn crackers, satay skewers with peanut sauce and sweet and sour dishes.